Base isolation HDRB is one of the most powerful tools of earthquake engineering pertaining to the passive structural vibration control technologies. 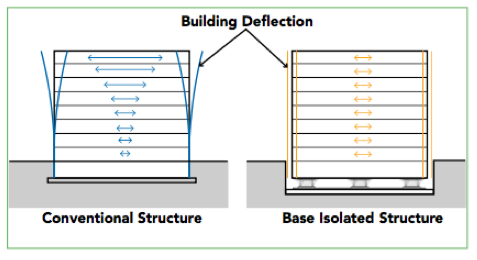 Base isolation offers important advantages over conventional protection methods because it reduces the earthquake forces transmitted into a structure. Thus it protects not only the structure itself but also the contents and secondary structural features. Such a capability is particularly important for buildings such as hospitals and emergency facilities that need to maintain full serviceability after an earthquake. Base isolation has now become an established and accepted technology all over the world. The technique is applicable to bridges and industrial structures, such as LNG tanks, in addition to buildings. It is suitable for upgrading existing buildings. The capability to protect the contents is a major advantage for buildings such as hospitals and emergency centres where maintenance of functions during and after an earthquake is necessary, and in cases such as museums and advanced technology factories where the value of the contents is high. In seismic isolation part or all of the superstructure is separated from the lower part of the structure by an interface that is soft and exible in the horizontal direction. Generally, the interface is placed between the foundation or basement and the ground oor and so the term base isolation can be accurately applied. In a base isolated building, the structure is isolated from its foundations so as to minimize the effect of ground motion on the superstructure and, thereby, reduce its force and de ection response. The difference in how conventional structures and base isolated structures respond to earthquakes is illustrated in the gure below. Savings in the superstructure can be expected through a reduction of forces afforded by the isolation. The reduction in forces also allows for greater exibility in space planning and reduced footprint of structural elements. Additionally, foundations under lateral load resisting elements may be reduced with base isolation. Isolation is achieved by mounting the structure on a system of supports giving a low stiffness in the horizontal direction. 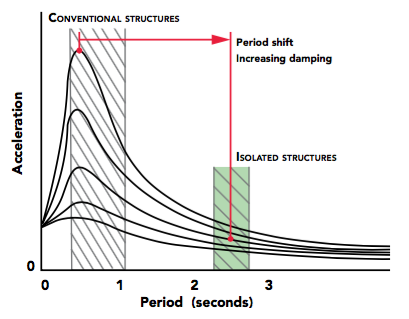 The natural period of the structure on the isolation system is typically two seconds. This period is chosen to be long compared with both the dominant period of the earthquake ground shaking and the period of the superstructure in the xed-base conditions. The gure below shows that the period lengthening achieved greatly reduces the acceleration response compared with that of a typical conventional structure. It also shows that the response to input excitations at the isolation period, and the amplitude of the horizontal movement of the structure. It is important to realise that despite the need for some damping, the isolators are not principally acting to absorb the energy of the earthquake, but are providing an interface that re ects earthquake energy back into the ground so reducing its transmission into the structure. The effect of the isolation system is that during an earthquake the structure moves virtually as a rigid body on the isolators. The deformation is concentrated at the isolation interface, but unlike the structure the isolation system can accomodate large deformations without signi cant damage. Because the technique is one of isolation it should be noted that high levels of damping (>15-18%) are not bene cial for structures (eg. multi-storey buildings) for which higher level oscillation modes may be excited. 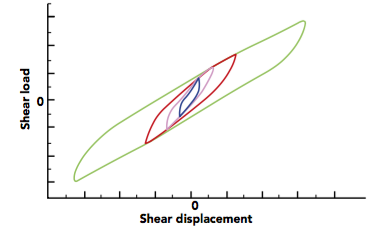 For a correct dimensioning of damping rubber bearings, in view of an intervention of base isolation of a structure, we need to consider properly the following typical properties: horizontal stiffness [kN/mm], damping [%], horizontal displacement capacity [mm], vertical stiffness [kN/mm], vertical load capacity [kN]. The horizontal force-de ection loops for a small bearing over a range of displacements are shown in the gure above; the stiffness is seen to be higher at small de ections. The area of the loops indicates the level of damping intrinsic to the bearing. thickness of steel reinforcing plates. Generally, an equivalent linear model is used to represent the stiffness and damping of the isolator. ability to function again after the design earthquake. High Damping Rubber Bearings (HDRBs) are a simple, cost-effective and maintenance-free means of providing the isolation interface. They can be designed to withstand the design earthquakes without signi cant damage. The HDRB consists of alternative layers of rubber and steel. The steel plates can greatly increase the vertical stiffness of the bearing; a ratio of around 800:1 between vertical and horizontal stiffness is typical. The plates enables the bearing to support the vertical load even under a large shear displacement. The bearing is supporting the design vertical load even with a shear deformation suf cient to produce no overlap between the top and bottom bearing endplates. A strong bond between the rubber and steel is critically important to the correct functioning of the bearing. The rubber (usually a compound based on natural rubber) is specially formulated to give the damping required. 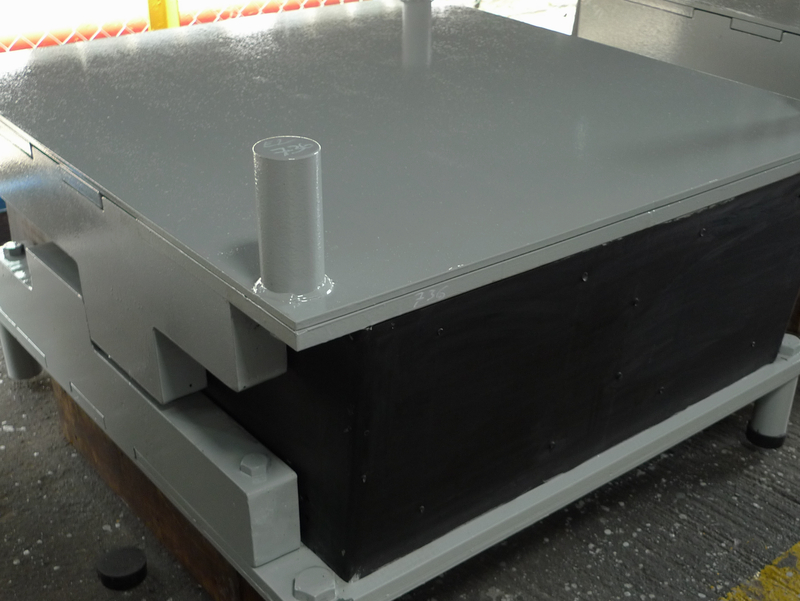 The use of high damping rubber avoids the need for auxiliary dampers such as viscous or elasto-plastic steel dampers in the isolation system. 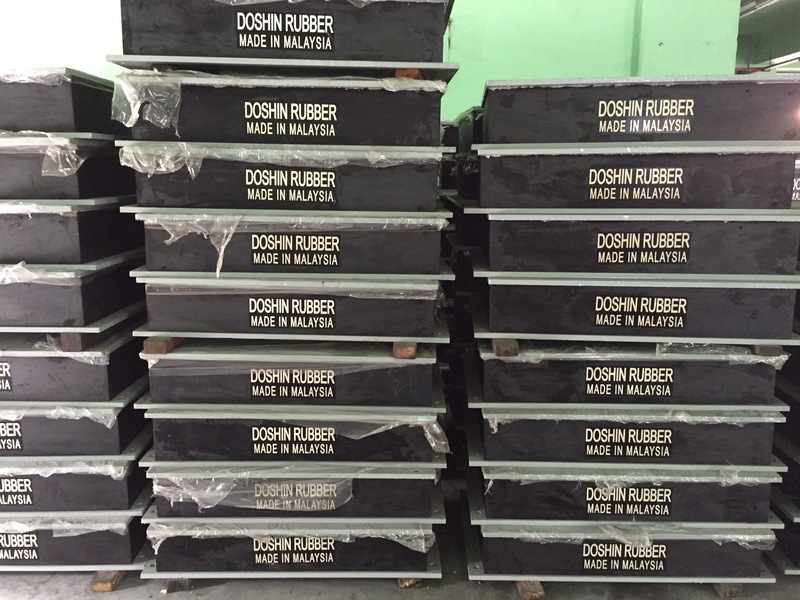 DOSHIN RUBBER’s HDRBs are steel laminated rubber bearings made on specially formulated high damping rubber compounds. The rubber compounds used for the production of DOSHIN RUBBER’s HDRBs are characterized by a dynamic shear modulus G variable from 0,6 to 1,3 MPa and an equivalent viscous damping coef cient (at shear strain, y=1) varying from 10 to 20%. The non-linear behavior of the compounds means at low strains the modulus is higher, allowing only slight movement due to forces such as wind. The steel lamination ensures a high compression stiffness to support the vertical load. hard compound (H), with a high modulus (G=1,3 MPa). DOSHIN RUBBER’s HDRBs are identi ed by the mark DSH followed by a letter (S, N or H to indicate the type of compound – soft, normal or hard) and 2 numbers; the rst representing the diameter in millimeters while the second indicates the total thickness of rubber in millimeters. DOSHIN RUBBER can develop alternative rubber compounds to satisfy different design requirements and can design seismic isolators to all the international standards. The information provided is intended for preliminary calculations. 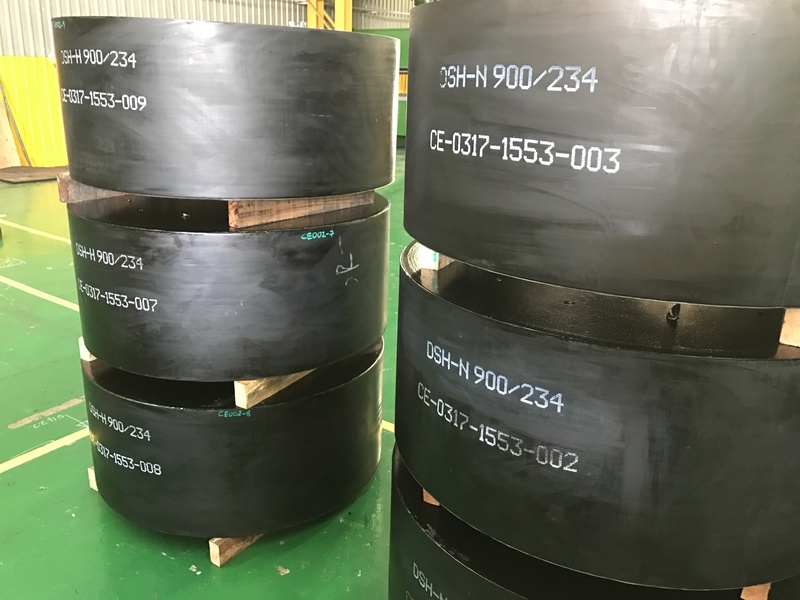 DOSHIN RUBBER would discuss with its clients their application and would be happy to consider any adjustments to the geometry and connection details of the bearings to suit the project requirements. DOSHIN RUBBER can develop alternative rubber compounds to satisfy different design requirements and can design seismic isolators to all international standards.